SOMETIMES AN IDEA JUST TAKES OFF AND THERE’S NO STOPPING IT. THAT IS EXACTLY HOW KNOCKOUT MELTS GOT ITS START. In 2013, Dubuquers welcomed their first food truck with open arms and a hearty appetite for something new. 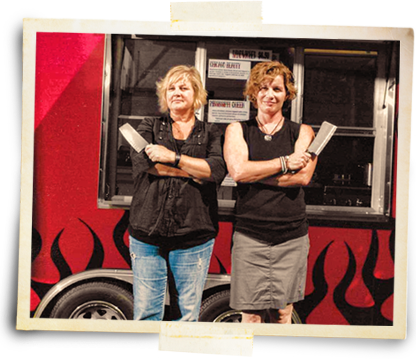 Originally dubbed Beauty & the Beef, the mobile food concept was brought to life by Kathy Conway and Teri Link. Over three years of warm weather lunches and late night festival snacking, the idea for the first brick and mortar location slowly grew and took hold. Open in June of 2016 (then as American Bombshell), Knockout Melts strives to retain that ‘food truck fun’ feeling while being accessible every weekday for lunch. Kathy and Teri continue to keep in close contact with their friends through multiple social media platforms – check them out on Facebook, Twitter, and Instagram. Grilled on our signature panini bread. SERVED 7:30 a.m. UNTIL 10:00 a.m.
Crispy bacon and scrambled eggs, on a bed of seasoned hashbrowns, with melty cheddar cheese. Spicy chorizo sausage and scrambled eggs, on a bed of seasoned hashbrowns, with melty cheddar cheese. Classic ham and scrambled eggs, on a bed of seasoned hashbrowns, with melty cheddar cheese. Fresh green pepper, onion, mushroom and scrambled eggs, on a bed of seasoned hashbrowns, with melty cheddar cheese. Delivery is available from EatStreet. Place your delivery order online using one of the buttons below. © 2019 Knockout Melts. All rights reserved. Brand and Web Design by Luckythirteen Design, Dubuque, Iowa.